The UT-300 Series Universal Tablet Cradle is the latest in Havis’ line of unique mobile office solutions for a wide variety of tablet models and sizes. Havis Inc., designer and manufacturer of computer docking, cradling and mounting solutions for mobile applications, has launched the UT-300 Series Universal Tablet Cradle to maximize the productivity of mobile workers. The UT-300 Series features three-point adjustment controls in a compact design to make it easy to mount a wide variety of tablet models while optimizing available in-vehicle space. The UT-301 Universal Tablet Cradle is designed with high-performance PC-ABS thermoplastics for ensuring strength and heat resistance in harsh conditions. The cradle’s leg retainers are reinforced with fiber-reinforced polymer to enhance durability. Safety features such as an easy-to-use latch handle, and lock and key provide security and theft deterrence. The universal cradle was designed with rounded corners and edges for added safety in case of potential accident. The UT-301 Universal Tablet Cradle combines comfort, safety and quality to increase mobile worker productivity. 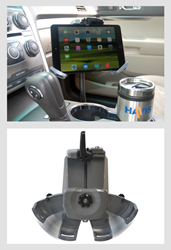 For more information on Havis’ UT-301 Universal Tablet Cradle, visit http://www.havis.com/products/DEVMT_UTM_UNVMT-123964-51127.html. For more information on Havis equipment mounting solutions, visit http://www.havis.com/products.htm or contact your Havis representative. Havis Inc. is a privately held, ISO 9001:2008-certified company that manufactures in-vehicle mobile office solutions for public safety, public works, government agencies and mobile professionals. For more than 80 years, the Havis mission has been to increase mobile worker productivity with industry-leading products that are built to the highest safety and quality standards and are designed with comfort in mind. With headquarters in Warminster, Pa. and an additional location in Plymouth, Mich., Havis currently employs 250 people. For more information on Havis, please call 1-800-524-9900 or visit http://www.havis.com.